Shivanu Thiyagarajah, 6 Degrees Young Advisor | Co-Founder, TamilCulture | Director of Marketing at Lucova Inc.
My older sister and I moved to Canada from Sri Lanka in the early 90s when I was 9, after both of our parents had passed away. We were fortunate enough to have family members who had been living here since the 70s with the means to sponsor us through a formal process to give us a better life and the opportunities that so many other Tamil children were denied as a result of the ethnic conflict that ravaged Sri Lanka for decades. I still remember the amazement I felt as we started our new life in Toronto. There was snow, and ice, and doughnuts! But the most interesting thing to me was the people. I was able to interact with kids who looked so different from one another—­I had only seen Blacks, Whites and Asians in books and pictures before. As a child it felt like a wonder to have the different people of the world come together in one place, and become friends with them. This fascination with the diversity of our community has never left me. As I grew older, I began to question my individual identity and sense of belonging as a first generation Canadian. As a member of a visible minority community, there are instances when you can feel insecure about your Canadian identity. I remember being in Sochi for the 2014 Winter Olympics, decked out in red and white, with our flag proudly flying behind me as a cape, and still having to repeatedly answer the question, “But where are you really from?” Then, there was the time a co-worker ignorantly asked me if I was a Tamil tiger after reading mainstream media reports about the height of the war in Sri Lanka. While they may be minor passing remarks, the accumulation of these types of experiences can cause you to ask: What is my identity in this country? For me, it’s that of a Canadian with a Tamil heritage, something I’ve been able to explore through my entrepreneurial initiative TamilCulture.com (TC). TC is a media platform that provides a voice for Tamil millennials around the world through editorial and user-generated content. As we expand to build teams in other countries like Germany and India, the people we work with globally are always impressed that a media company called TamilCulture, with the goal of reaching the 70+ million Tamil population worldwide, was founded in Canada. Canada is a country that allows you to tell your side of the story— where you’re from and what you’re about—while being fully integrated into society. This is a degree of freedom and inclusion that you will not easily find elsewhere, and one of the many values of our nation that I am truly proud of. 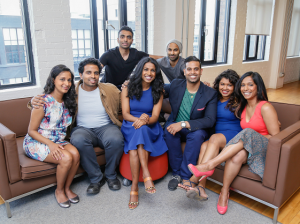 Photo: Staff of TamilCulture, the forum for Tamil millenials co-founded by Shivanu.